In yet another installment of our widely popular user submitted heat pump prices, we have another Trane heat pump price, this time for a Trane XB14 heat pump system in Florida. Loved reading about what other people are paying for their hvac systems, and wanted to add our recent experience to the list. 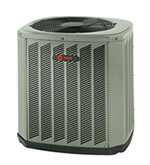 We knew we wanted a Trane (our neighbors love theirs) but also knew we couldn’t afford the higher cost ones. After researching online and then getting several price quotes, we decided on a 2.5 ton trane xb14 from a well known company in our area. Took a crew of 3 guys a full day to complete the work, and a few days later, our sales guy came back to check on everything again. We have lived in our house (which is +30 years old) for 7 years and never had any problems out of the old heat pump until it just quit one day. The service guy said it was manufactured in 1995 and was a GE model. Honestly, the only time we ever paid it any attention was during annual maintenance and after cuting the grass each week, my husband would wash it down to get all the grass off it. The utility closet is on the outside of the house and the system is installed inside it. Our house is on a slab. The company that (we now love) replaced the system was the most professional out of all the others. They were in uniforms, called us promptly before, during and after the sale, and we just got the best vibe from them. If you would like to share information about your heat pump prices, please use the share-a-price page, and let us know. We try to publish one new hvac estimate every day!